United Kingdom, Republic Of Ireland, 23rd September 2013 – Canon today unveils a new program to help engage students in the world of photography. 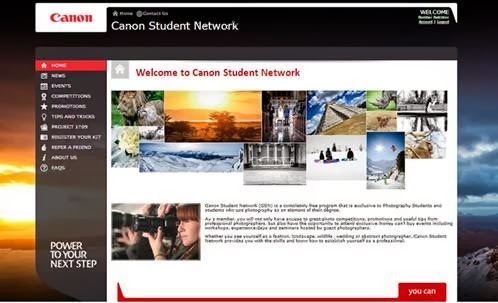 The Canon Student Network (CSN) is designed to help aspiring photographers studying photography or equivalent courses to take their next step with imaging and further develop their love of photography along with real world business advice. The initial phase of the program, which launches today, rolls out to 11 universities across the UK and Ireland and provides tailored experiences, opportunities and offers to help the students develop, as their course progresses. The opportunities for students include experience events to find out what it is like to be a professional photographer such as “Shoot the Show” at London Fashion Week. There will also be events for those interested in most types of photography including sports, wildlife, portrait and wedding. Education including tips, tricks and business advice from noted professional photographers via seminars around the country and online are also available along with unique offers. There is the opportunity to network with prospective companies and agencies to help establish contacts suitable for a working life in photography once they complete the course. A headline photo competition, where the winner will have the opportunity to have their photo used as the main image within a major Canon campaign including print, outdoor and online advertising as well as in store, is a huge opportunity for any budding photographer. The opportunities, benefits and training compliment and progress with the courses the students are studying. As the program has been developed in partnership with the universities, it ensures the program will be of benefit to the course work set and future employment prospects of the students. Access is easy and free for eligible students. Those in first year simply need to be studying photography or equivalent course, within one of the initial 11 roll out universities and sign up to the free Project 1709 – Canon’s beta online imaging management system. Students in their second year will also be required to own a current Canon DSLR and lens. A course for students in their third year will be rolled out in the next academic year, there will be no extra requirement for students in order to join.